Li River originates in the Mao'er Mountains of Xing'an County, northeast Guilin. It winds its way for 437 kilometers, passing through Guilin, Yangshuo and Pingle. The course of the river from Guilin to Yangshuo is known by the name of Li River, with a distance of 83 kilometers. "One hundred miles on Li River, one hundred miles of art gallery." The 83-kilometer waterway of poetic Li River is flanked by unusual karst hills and clusters of ancient villages. The most stunningly beautiful scenes of Guilin landscape are found along the Li River. Peaks upon peaks of green karst hills flank the river, forming an imposing backdrop; the smooth water exquisitely mirrors a fairy-tale landscape of conical peaks reaching for the blue sky. In drizzly days, the peaks along the river embraced by clouds and mists are just a natural Chinese landscape painting. Mists weave themselves around the peaks; the vapor hides then exposes the peaks in moments of surprise. Beside the amazing Guilin karst Mountains, visitors may appreciate idyllic countryside scenery. Farmers tending rice paddies; Women kneel on the banks washing clothes; and, water buffaloes take a dip in the water to cool off from the heat. Another interesting sidelight is seeing fishermen gliding on the Li River on narrow bamboo rafts. What a peaceful rural life! 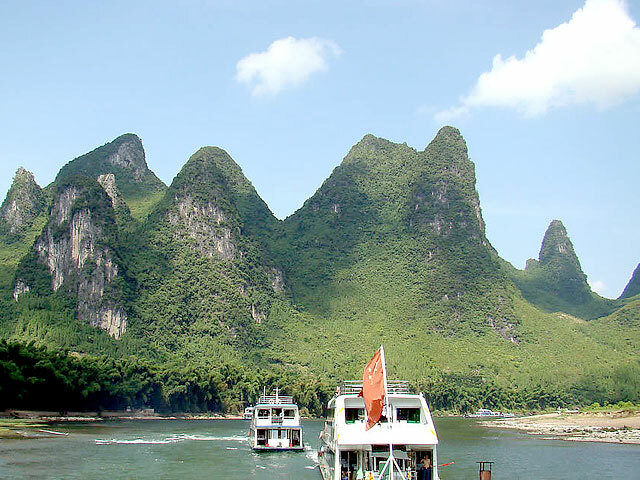 Li River cruise from Guilin to Yangshuo is the highlight of sightseeing tour in Guilin, China. It will take 4 to 5 hours to arrive depending on the speed of the current. According to its different scenes, the journey could be divided into three sections: Guilin to Ox Gorge, Ox Gorge to Water-Dropping Village, and Water-Dropping Village to Yangshuo. Gorgeous Karst peaks will inspire you at almost every bend of the limpid river. Impressively, visitors can admire the real beauty of the scenery on RMB 20 banknote. For outdoor enthusiasts, hiking or biking along Li River is also a wonderful experience. Most parts of the routes are flat, and the terrain doesn't have many ups and downs. It offers a unique perspective to appreciate the scenic Li River.